Paducah tends to face bad storms throughout the year. When damaging winds came through the area a large tree fell on this home, damaging it servery. SERVPRO of Paducah rushed to the scene and got to work. They took the right steps and proper precautions to remove the tree without causing any additional damage to the home. SERVPRO of Paducah responds quickly and will help in every way that they can. If you experience a storm event of any kind and need help, call SERVPRO of Paducah. 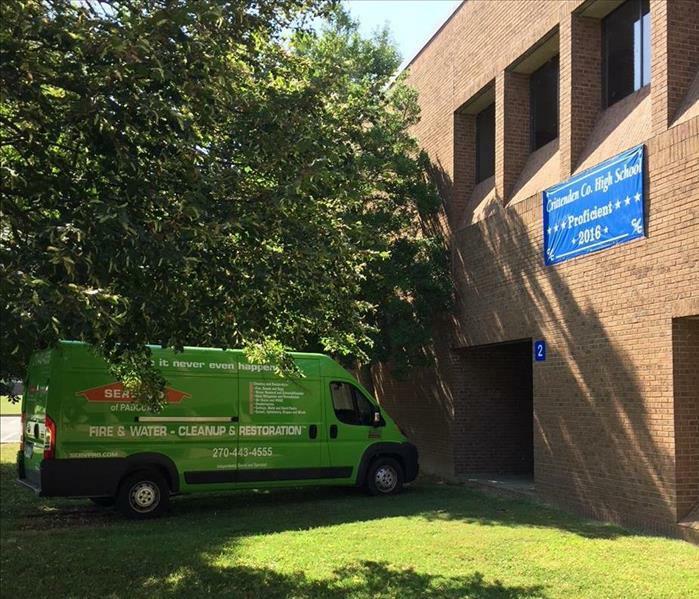 Our team will tackle any job, big or small! This carpet had some water/flood damage. Our SERVPRO team got it dried steamed and ready to be put back where it belonged! SERVPRO of Paducah responded to a small water loss that left behind messy carpet. In the matter a few hours, the carpet was cleaned and put back together, "Like it never even happened." Paducah and Mayfield, Kentucky are situated on the edge of "Tornado Alley" and have been known to experience strong storms. 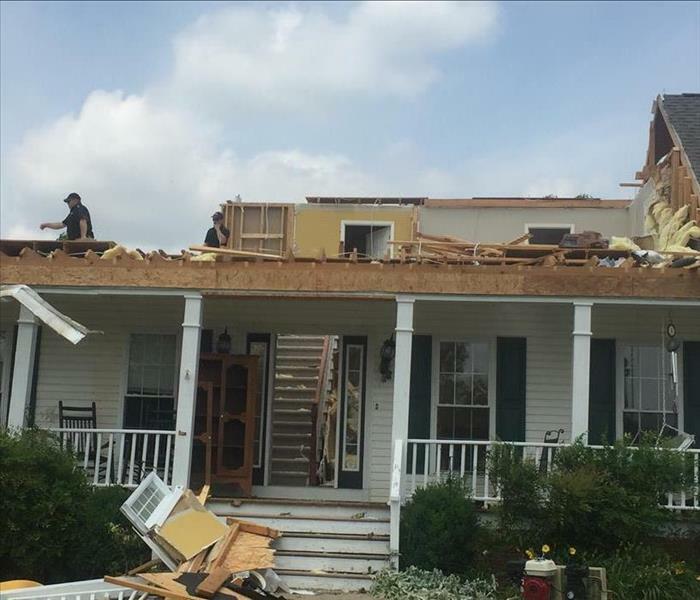 When a tornado came through the area and severely damaged this home, SERVPRO of Paducah rushed to the scene. The crew quickly secured the contents in order to save them from further harm. Mold is the sneakiest of threats to your home. It loves to creep into relatively unused spaces, inside walls where it cannot be scene, or behind cabinets. 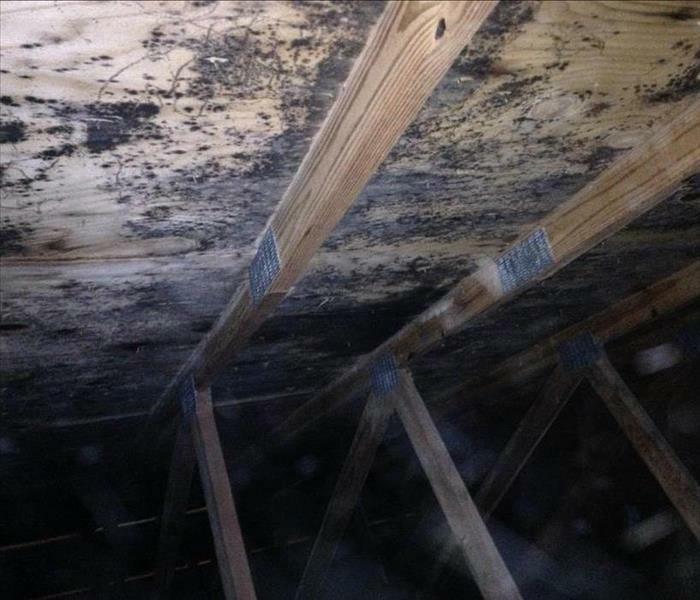 This homeowner discovered mold in her attic after noticing a slight odor. Any amount of mold can be dangerous, especially to the young or to the elderly. Luckily, SERVPRO of Paducah knows how to tackle this sneaky issue. If you suspect mold in your home, call SERVPRO of Paducah at (270) 443-4555. 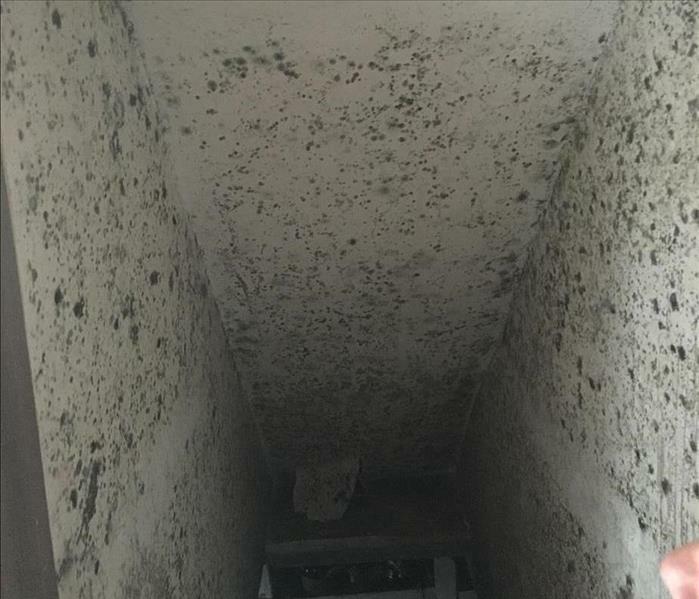 Sometimes mold is where you expect it - in a damp basement or above a shower that isn't well vented. However, here at SERVPRO of Paducah we know just how sneaky mold can be. When the customer at this home called about a water spot on a ceiling, SERVPRO of Paducah responded and checked for the source of the leak as well as additional moisture. 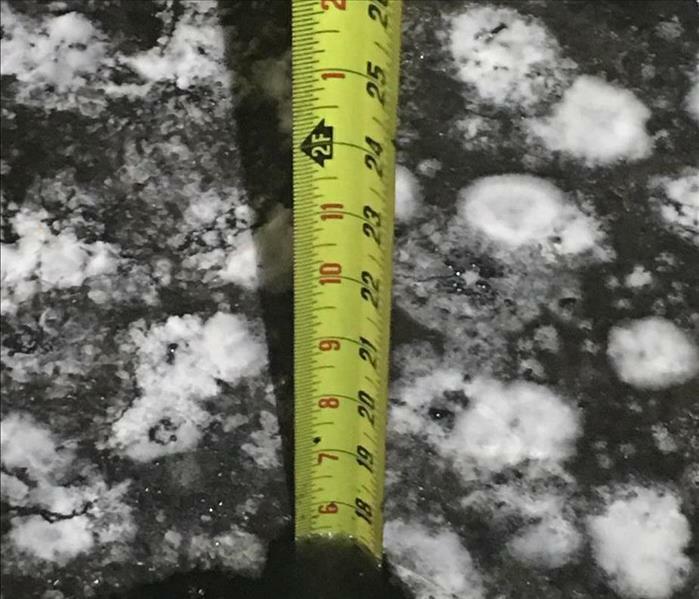 It was discovered that a very tiny but persistent roof leak created a lasting moisture issue that allowed mold to develop and spread. The SERVPRO of Paducah crew tackeld the issue with expertise and the home is back together, "Like it never even happened." When fires occur, the smell of smoke can be the most lasting damage. 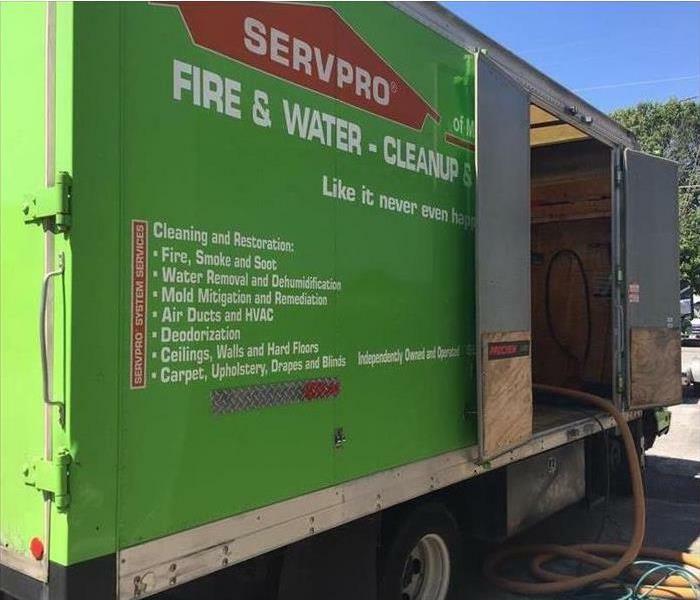 SERVPRO of Paducah uses many techniques to combat smoke damage. One such technique is thermal fogging - a process by which small particles are created to mimic smoke. These particles are deodorized and get into tiny spaces (fabric, cracks in walls, etc) where smoke particles might have been absorbed. 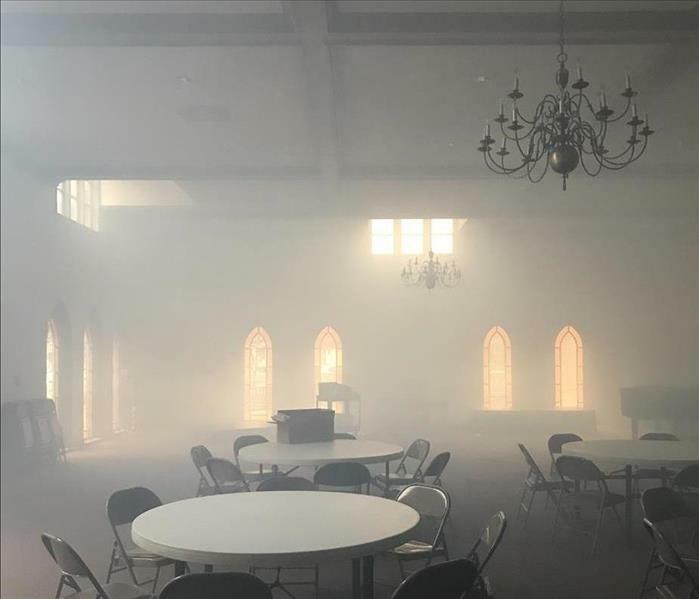 The above images shows thermal fogging being used in a church where a small fire began and created significant smoke damage. If you have smoke damage in your home or business, call SERVPRO of Paducah at (270) 443-4555. How Do We Remove Smoke Smell From Contents? It is not just flames from fires that cause damage to your home or business. Oftentimes smoke from fires can cause the most widespread damage. A typical washing machine or a wipe-down with soap and water will not always get the smell of smoke out of contents. 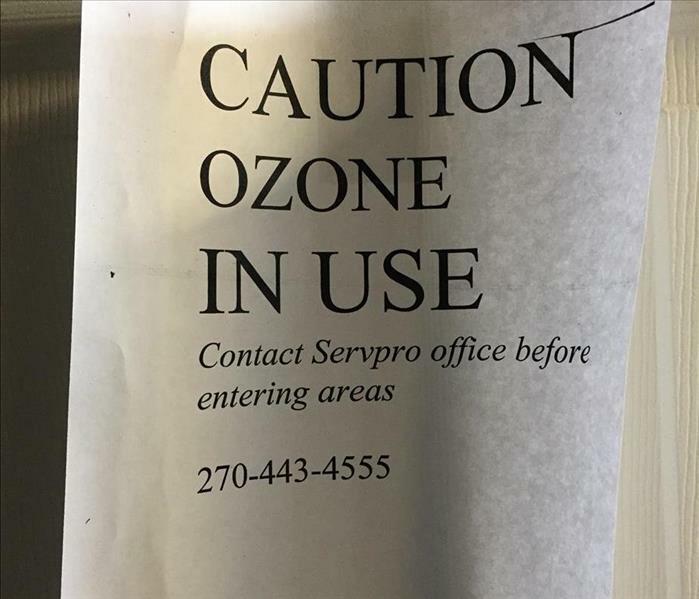 SERVPRO of Paducah takes the extra step and uses an OZONE machine to deodorize and disinfect materials after contact with smoke. Fire in Kentucky? Consider Yourself Lucky! Lucky? Yes! SERVPRO of Paducah is there for you when you need us most! Check out our before and after photo gallery to see how we turned this disaster into a masterpiece! It's a Bird! It's a Plane! No, it's Team SERVPRO! 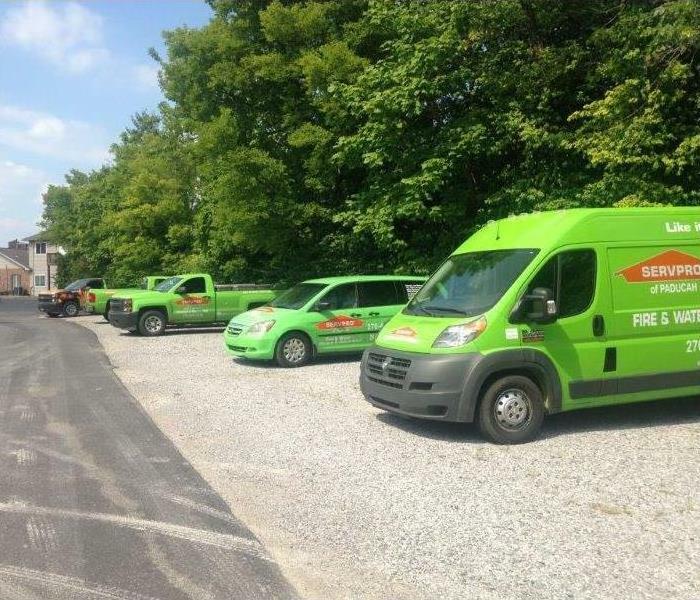 SERVPRO of Paducah is always ready, 24/7 for any and all of your emergency needs. When you see the SERVPRO Green, know the professionals have your back! Call us today at (270) 433-4555! 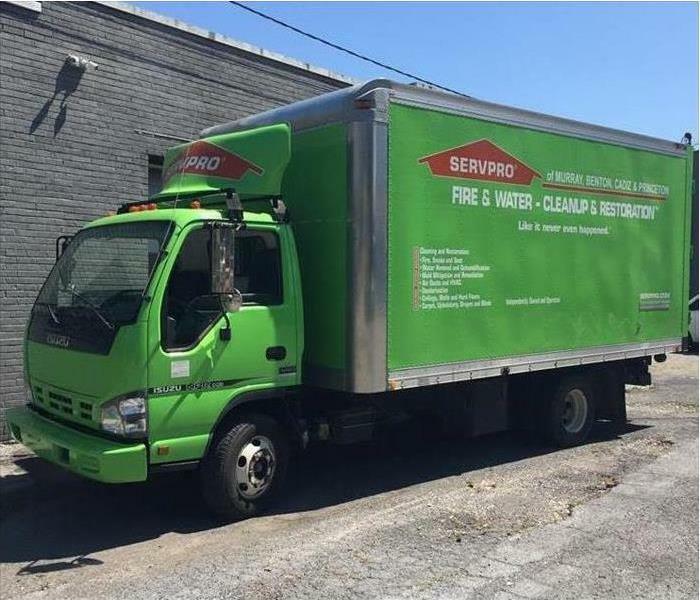 Our SERVPRO of Paducah team puts this truck to use anytime it's needed! This time it was called upon for water extraction after a hot water tank leaked. For our services, call SERVPRO of Paducah at (270) 443-4555! Mold can be lurking in the most unlikely of places. 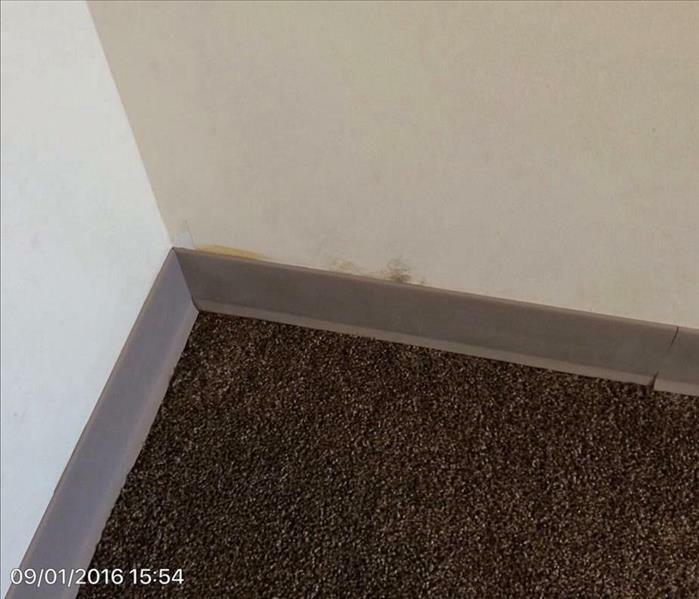 Managers at this local assisted living facility found mold behind the baseboards due to a slow window leak. Though it wasn't a large amount of mold, even the smallest amounts can cause health affects. 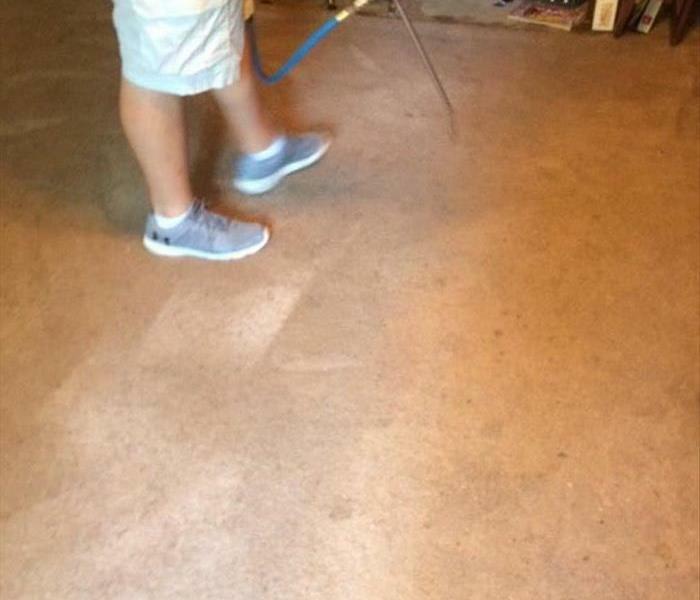 SERVPRO of Paducah responded to the job quickly, removing baseboards and eliminating mold. 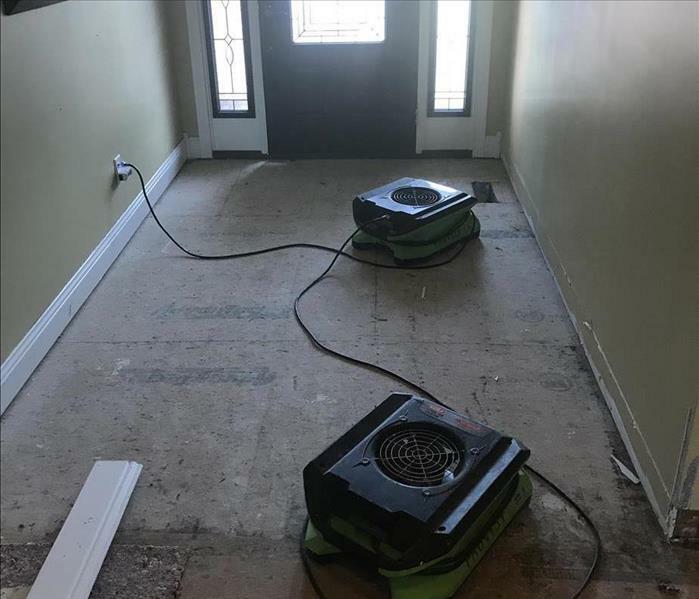 At SERVPRO of Paducah we use air-movers and dehumidifiers to dry out materials after water damage events. They are typically used to dry subfloor, drywall, and ceilings after being saturated with water. These units are monitored by crew members periodically to assess dry-out progress. The residents at this local home were alerted to a fire when their dog woke them in the middle of the night. 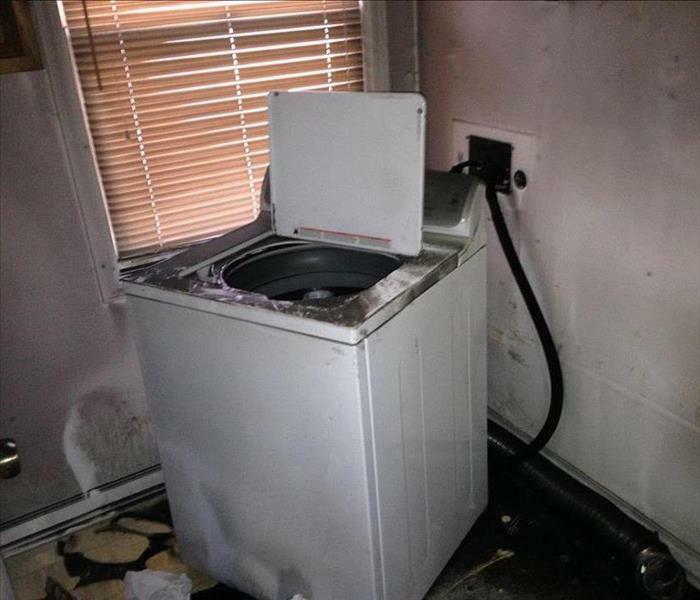 A fire had begun in the laundry room due to a faulty mechanism in the dryer. Firetrucks were called to extinguish the fire and, when it was determined that it was safe to enter, SERPVRO of Paducah got to work! At SERVPRO of Paducah we understand the importance of getting your home or business back to working order as quick as possible. 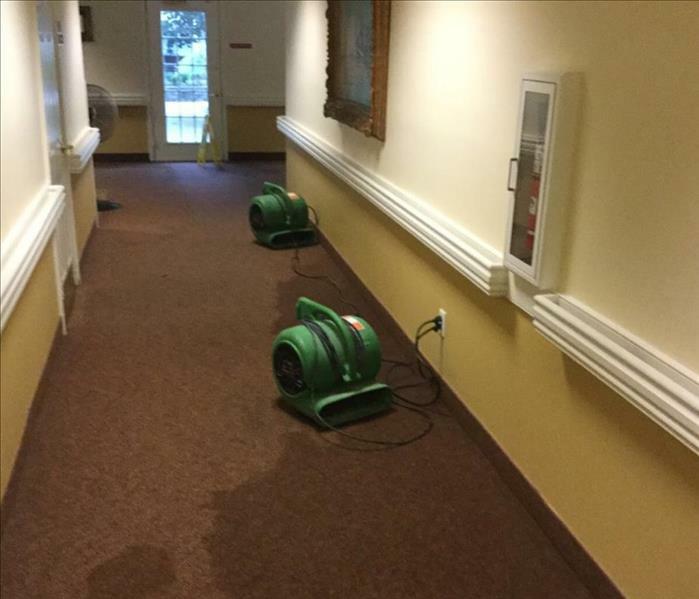 When SERVPRO of Paducah got the call about a water loss at this assisted living facility, crew members responded immediately to ensure residents would be as unaffected as possible. An unfortunate fire occurred at a local apartment unit. The fire caused extensive damage to the interior of the unit, requiring the majority of the drywall, flooring, and contents to be replaced. The fire also damaged the exterior of the unit. The window near the fire's origin allowed heat to escape, melting the surrounding siding. SERVPRO of Paducah responded promptly in order to put the unit back together, "Like it never even happened." Water damage is not always visible. Often leaks can be slow and inside walls or under flooring, leaving very little outward signs of water. 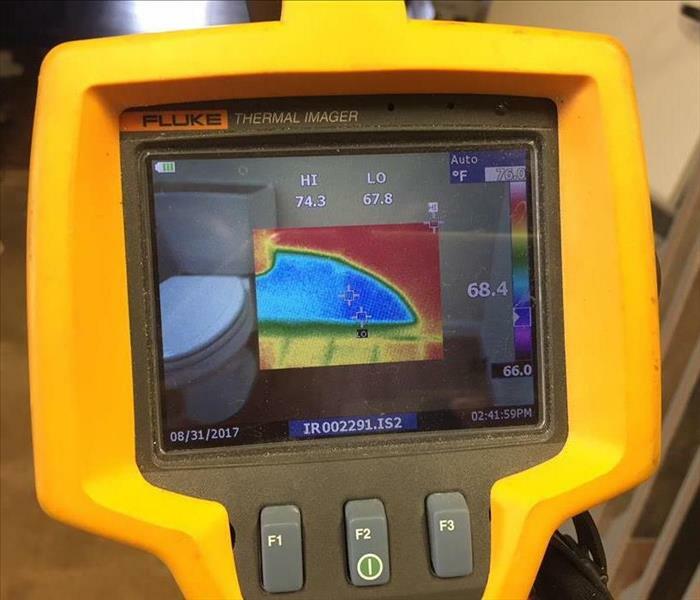 SERVPRO of Paducah uses thermal imaging to detect minute changes in temperature, indicating possible water issues. Call SERVPRO of Paducah at 270-443-4555 if you think you might have a water problem! Mold can quickly get out of hand. When the basement of this home flooded and was left to sit for a short time, mold found it's was up the walls and stairwell. Mold this significant can cause many health issues, some life threatening to children and elderly. SERVPRO of Paducah responded to the job and removed all drywall containing mold. There is very little we can do to change the mind of mother nature. Unfortunately this home was in her path when a tornado came through the area. 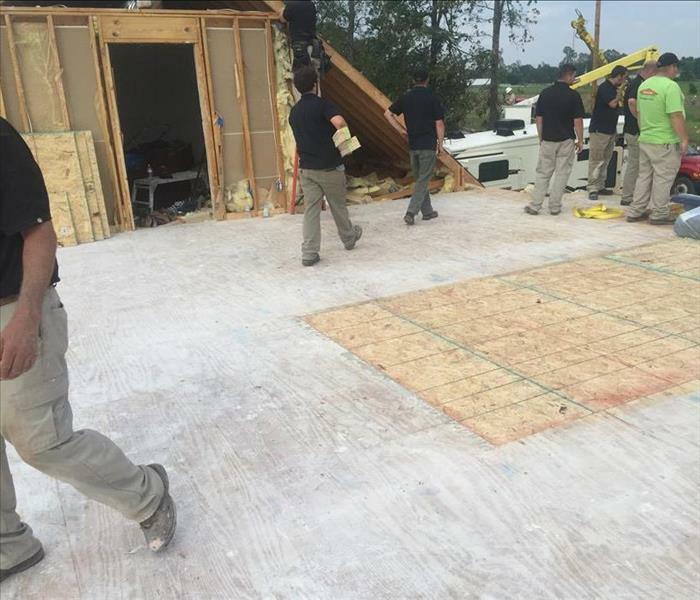 During such events, SERVPRO of Paducah understands the necessity to respond promptly and efficiently to secure contents from further damage. What Happens When a Tree Falls On Your Roof? 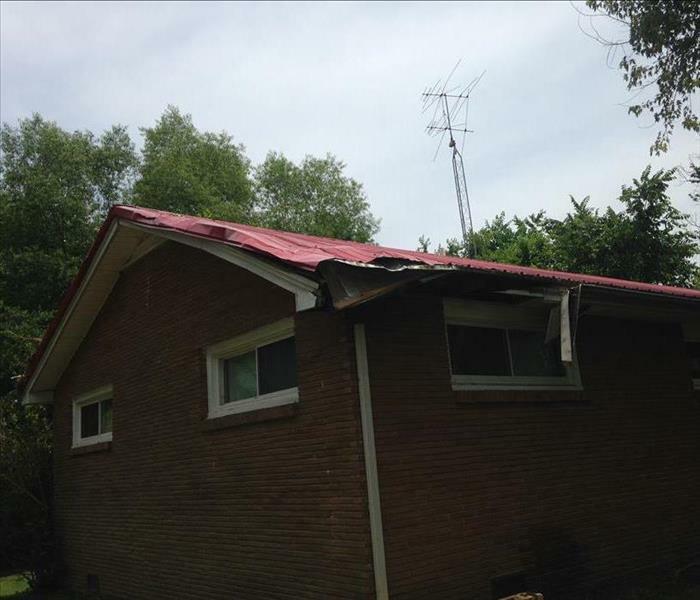 At SERVPRO of Paducah we see a surprising number of incidents where a tree falls on a roof and causes significant damage. Often in these events more damage occurs because rain is allowed in. 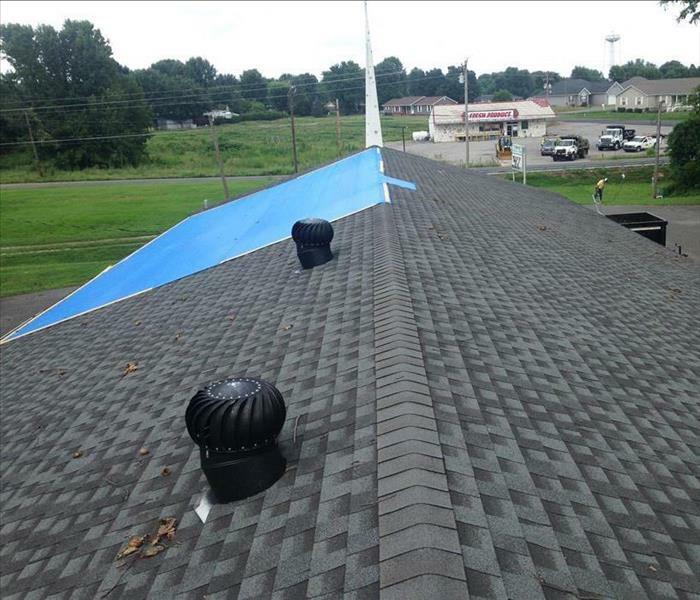 When SERVPRO of Paducah responds to roof damages, we quickly rush to the scene to tarp it off, keeping the home or business from further harm. Severe weather it the area and caused a tree to fall on the roof of this church. The hole allowed water to come in and saturate the carpet and some walls. This image shows a SERVPRO of Paducah crew member hard at work to quickly dry the church. Members of this church in Paducah, KY arrived to water in the parking lot, even though it had not rained in several days. 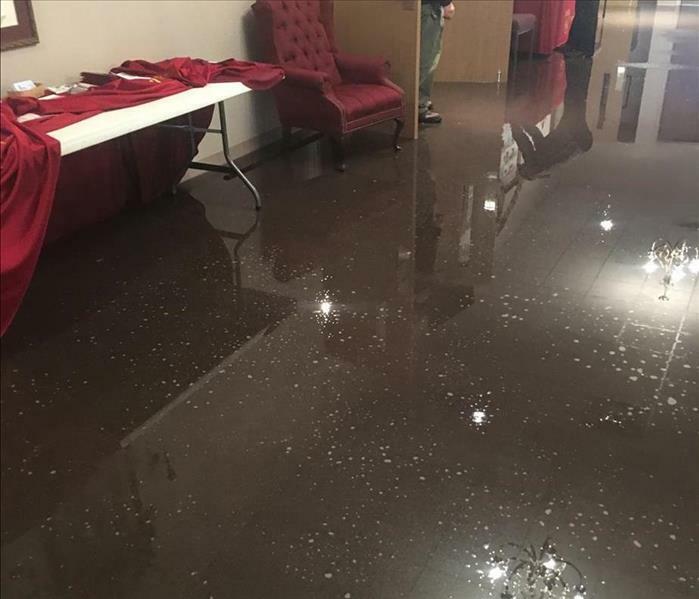 They opened the church doors to find standing water throughout the halls and the sanctuary. 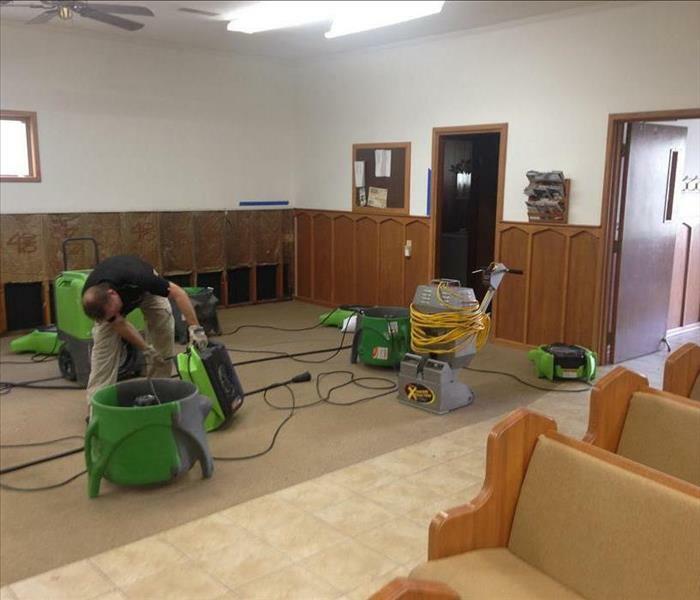 SERVPRO of Paducah rushed to the job to help get the church back in working order! This home experienced a large fire that left a hole in the roof. This hole allowed rain in and resulted in nearly six inches of standing water in the basement. The standing water left to sit for just a short period of time created an enormous and dangerous amount of mold. Lesson: Do not allow water to sit in your home! This SERVPRO of Paducah crew member is ready to tackle your mold issues! 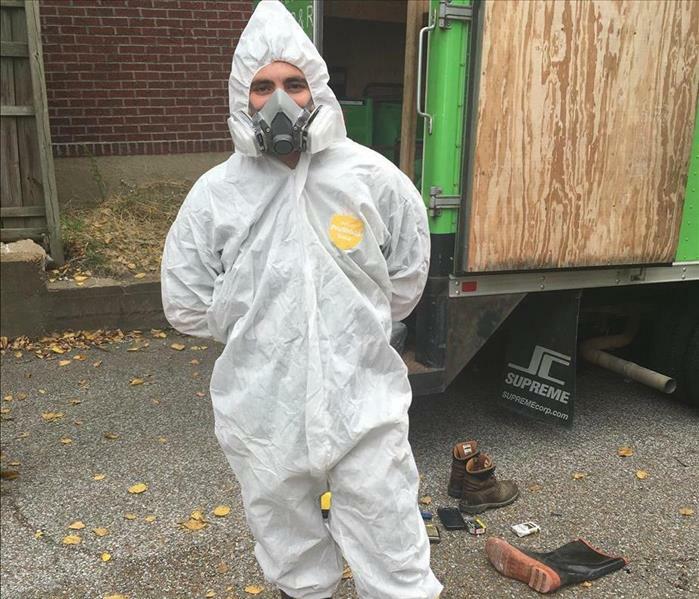 When dealing with mold, crew members wear Tyvek suits and respirators. The suits protect from exposure to harmful mold and respirators filter mold particles from the air breathed in. 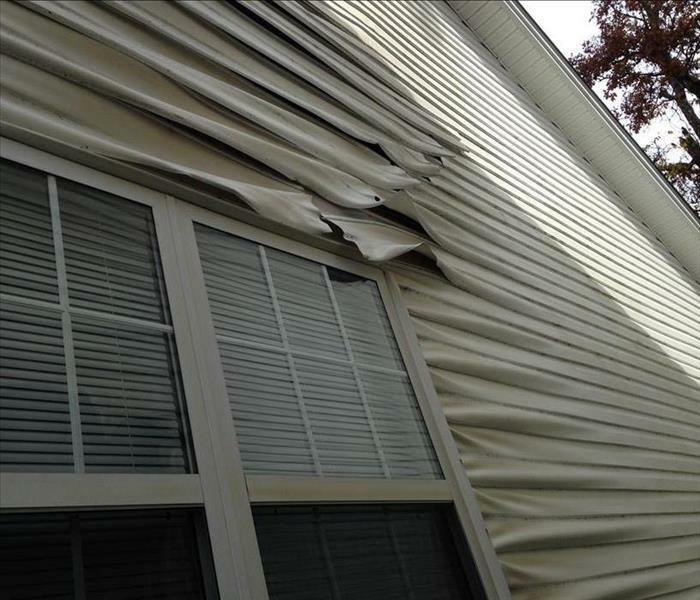 Though damage to the outside of this local apartment does not appear to be significant, interior damage was severe. A window was broken in and a fire was set behind the couch (the window can be seen in this image.) 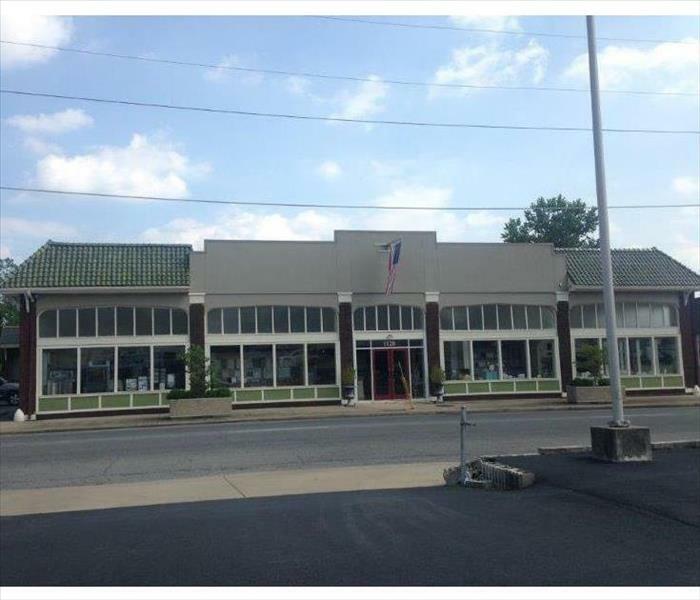 SERVPRO of Paducah swiftly responded to the scene and has since remedied the interior and exterior damage. Paducah, KY has been known to experience dramatic weather events, from ice storms to tornadoes. While some residents are unscathed after these events, others are left to deal with the consequences. When a tree fell on this roof after a strong wind event, SERVPRO of Paducah responded promptly, ensuring no further damage could occur. Each person pictured is a dedicated member of our team and here to help as soon as they answer the phone! In water and fire disasters more than just structural damage occurs. SERVPRO of Paducah has the capability to clean 90% of all soft contents with our Esporta iS4000. Soft contents include personal items such as clothing, bedding, outerwear, pillows, and stuffed animals. 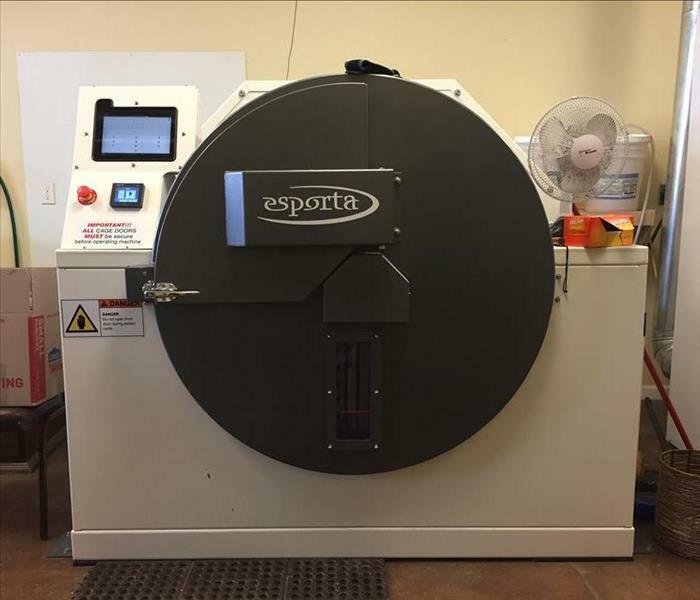 The Esporta machine is capable of cleaning soot, sewage, water damage and bio contamination. 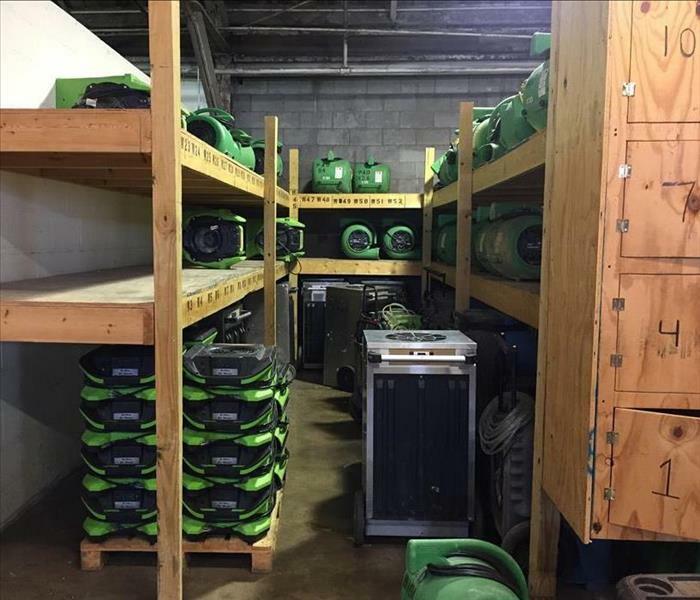 This is only a portion of the equipment we have on hand, ready to service your water damage needs 24 hours a day! Whether your property is commercial or residential, a huge loss or a small leak, we are here and ready to help! 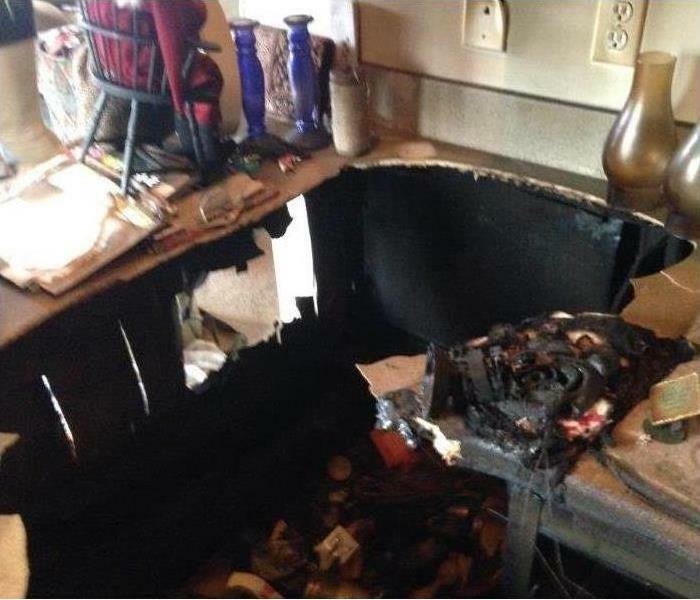 This was some extreme fire damage that occurred in a Western KY apartment Complex. 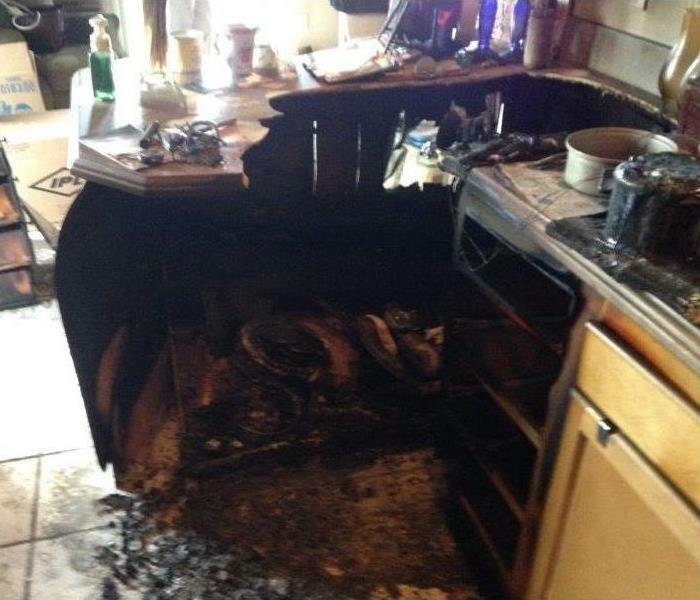 Our team promptly and effectively remediated this kitchen fire damage. Check out our before and after photos to see the amazing results! We're lined up and ready to go! We've got a vehicle for every job, big or small! We do them all. When emergency strikes your home or business, call Paducah SERVPRO! Fully trained, fully staffed and full time! Our SERVPRO of Paducah team is always prepared to help you out! Be sure to stop by our office and say, "hi!" anytime! 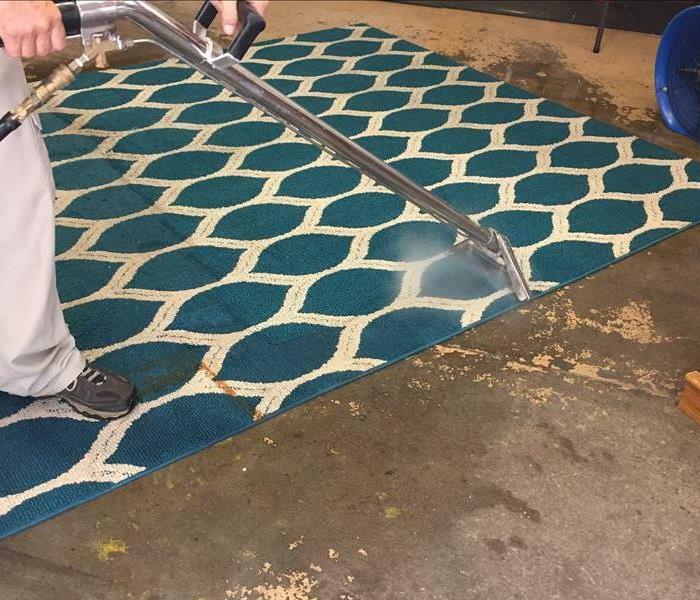 One of our teammates putting in hard work to ensure this carpet gets a high-quality and timely cleaning after this house experienced fire damage. 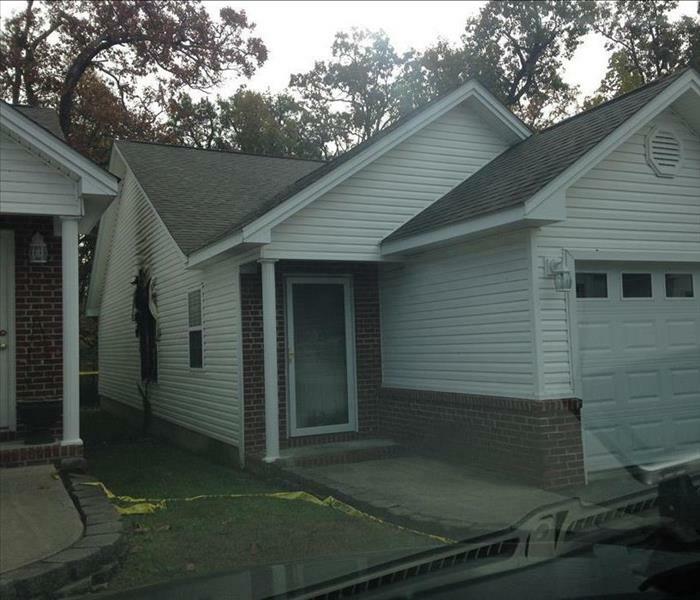 Check out our before and after photos to see how it turned out!